Nathan Lyon's enthusiasm is contagious and his knowledge about farmers markets and fresh, seasonal, local food is inspiring. He’s got a culinary arts degree, a background in health science, 10 years of working with farmers at farmers markets under his belt, his 6th national TV show (Growing a Greener World on PBS) underway, and a cookbook coming out this year. Whew! This past Sunday, I met up with Nathan at the Hollywood Farmers Market in Hollywood, California, to see if I could glean the secrets of buying and cooking fresh, seasonal produce and to discuss all things organic, local, and delicious. After shopping, meeting farmers and fellow shoppers (Nathan seems to know just about everyone), and, of course, sampling fresh produce for about two hours, we sat down for a cup of coffee and a chat. Meet Nathan Lyon—chef, educator, TV personality, and, full-time smiler. Yogi Times (YT): I notice some of the farmers here at the farmers market are not organic. Why is that? Nathan Lyon (NL): The process of going from conventional farming to organic farming is a very lengthy and expensive process. Most of the farmers that I know and have worked with over the years farm smaller plots of land—10 to 90 acres—many of which simply don’t have the resources to convert to organic. That said, many of them already grow seasonal produce without the use of synthetic chemicals. I would consider them organic farmers, they just don’t have the certification (which can take up to three years to get). Just because you don’t see the certified organic label doesn’t mean that harmful chemicals have been used which is why I feel it’s so important to build a personal relationship with your farmer and to visit their farms to learn more about the process of growing organically. YT: It’s sometimes cheaper to buy produce at the grocery store than at the farmers market. Can you speak to this? Nathan Lyon: Since grocery stores have massive buying power, often times they can afford to undercut the prices of local farmers and provide a cheaper product to the consumer. However, your local farmer is part of your immediate community. The more you support your local farmer, the more you’re encouraging the preservation of land, the reduced consumption of fossil fuels, and the health of the ecosystem through sustainable farming practices. As a consumer, you have to decide for yourself if that’s worth the extra money. As a chef, I’m on a quest for the freshest, most flavorful ingredients. The produce on offer at your local grocery store has travelled, on average, 1,500 miles. So, the options are: produce that is harvested (often before it’s ripe), trucked, stored, shipped, trucked and stored again, then sold at your local grocery store versus a local farmer picking it the day of the farmers market, plunking it in the back of their truck and bringing it directly to you. For me, as a chef and a consumer, there’s no question. YT: The title of your upcoming cookbook is: “Great Food Starts Fresh.” Why did you choose that title, what does this statement mean to you? Nathan Lyon: Your finished dish will only be as good as the ingredients used to create it. For example, you can’t make a fresh salad with old, wilted lettuce—the flavor and texture of the salad would be compromised. On the other hand, using fresh, seasonal ingredients means that your dishes will be bright, well textured, and full of flavor. The secret to great food is fresh ingredients. At the end of the day, it’s best to just let the ingredients speak for themselves. You don’t have to be a classically trained chef either. Anyone with the desire and respect for great food can combine fresh, flavorful ingredients to create a culinary masterpiece. YT: Where does a person begin—how do they get cooking if they don’t know how to shop for or prepare fresh food? Nathan Lyon: One of the best parts about going to the farmers market is that it is a wonderful resource for having an open dialogue between the home cook, the farmers, the shoppers, chefs, and foodies, alike. You will literally find generations of information there. People are more than willing to share their personal experiences, recipes, knowledge and tips for preparing fresh produce. It’s a one-stop shop for anything about food—from picking to storing to cooking. If you start anywhere, this would be the place. YT: Many Americans are used to picking up ingredients the day of or a day before they are going to prepare their dinner. Since, in many cities, farmers markets are often only once a week, can you give some practical tips for how to shop at the farmers market? Nathan Lyon: Absolutely. Even though I find visiting my local farmers market both fun and life-affirming, I encourage people to plan their meals in advance, and think of it as a job…a really fun, tasty job! For me, I find that sitting down for 15 minutes is all it takes to figure out what I’ll be making for the majority of my week, and since properly stored produce will easily last for a week, you can plan your meals in advance. For example, two bunches of kale, which costs around 3 to 5 dollars, equates to a delicious vegetable soup, a raw kale salad, a breakfast frittata, and a rustic pasta dish. See, right there—four hearty meals with just a little forethought! Of course, never underestimate the knowledge of your local farmer. Chances are, they will have a few delicious recipes up their sleeve. After all, they are the ones growing your ingredients. YT: What do you think the biggest misconception is that people have about eating healthy? Nathan Lyon: I think there are two misconceptions, actually. First, that eating healthy is not going to be tasty. Second, that it takes too much time to prepare healthy food. YT: What do you wish to say to dispel these misconceptions? Nathan Lyon: With every person that I welcome to the farmers market for the first time, the moment that they taste the samples that are on offer—I look at their face, and it’s like the flipping of a light switch. Once you taste a ripe tomato or a really crisp, sweet apple, you realize that you don’t have to do anything with fresh, seasonal produce to make it delicious because it already is, naturally. Which also means, it doesn’t take a lot of time to prepare. Listen, I’ve watched people sit in their cars at the local drive through for 15 minutes waiting for their processed food. In 15 minutes, you could make pasta with fresh pesto, toasted pine nuts, and shaved parmesan and still have time to prepare a deliicious tomato avocado salad. That’s both tasty and fast, and, to be honest, I think it would a lot easier to do than siting in a drive through for 15 minutes! YT: What are your top 3 produce “must buys” at the Hollywood Farmers Market? Nathan Lyon: Well, my first stop is always Bernard Ranches for their oranges—they are the best oranges I’ve ever had. Second, you must try the strawberry tomatoes from Tamai Farms. Lastly, don’t miss out on the yellow nectarines from Ken’s Top Notch Produce. But, you never know, my next favorite “must buy” could be just around the corner. It’s all about seeing about what’s in seasons and tasting the samples. You really can’t go wrong. YT: Cooking challenge! What dish would you make with those three ingredients (oranges, strawberry tomatoes, and yellow nectarines)? Nathan Lyon: Off the top of my head? I’d pair those ingredients together with a bunch of very thinly sliced curly kale for one heck of a raw kale salad. Toss in some toasted, salted walnuts, roasted sunflower seeds, toasted pine nuts, diced apple, avocado, and dress it with a red-wine citrus shallot vinaigrette? Yeah, I’d eat that! YT: What can we expect to see in your cookbook, “Great Food Starts Fresh”? 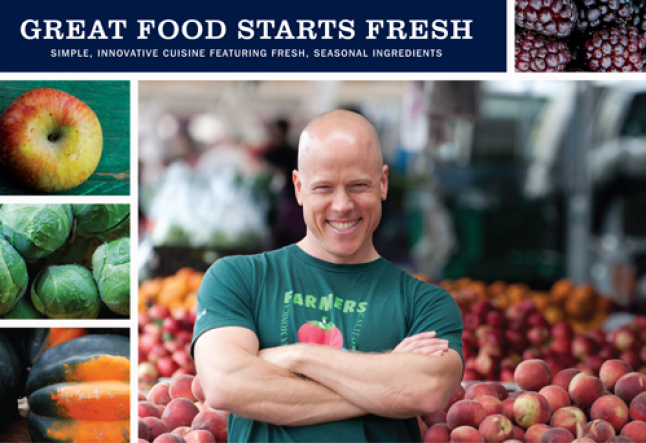 Nathan Lyon: "Great Food Starts Fresh" is based on the information I’ve accrued from my culinary training and my experience working side by side with farmers at Los Angeles farmers markets for over a decade. It’s a seasonal cookbook divided into the 5 seasons: spring, summer, autumn, winter, and the universal season—chocolate! There are over 100 delicious recipes (with plenty of vegan and vegetarian dishes), which are broken down into step-by-step instructions, photos to accompany the recipes, information on how to shop for, choose, and store seasonal produce, and additional information such as methods to streamline your cooking experience, cooking and shopping tips, stories, and more. It took over five years to complete; I'm so honored to share it with everyone. It’s definitely a goodie! Check out Nathan's raw kale salad wth feta, pine nuts, and cranberries recipe from "Great Food Starts Fresh." Photos thanks to Nathan Lyon and www.growingagreenerworld.com.